Updated 04-17-2019 - The mod has been updated to resolve the pie menu issues which originate from the 1.51.75 (April 16, 2019) game patch. The friendly exchange numbers interaction should no longer trigger jealousy reactions. When I started up the game after finally breaking down and purchasing Get Together I soon saw the "Exchange Numbers" option between Sims. "At last!" I thought, "strange Sims that mine had met once long ago in an alley somewhere will no longer be calling my played Sims." But I was soon disappointed (for those of you who also have Get Together, you know this was very very soon). The Exchange Numbers romance option is really just a fancy placeholder for asking for a date. So I turned my mind to making a friendly version of Exchange Numbers that actually did just what it suggests. 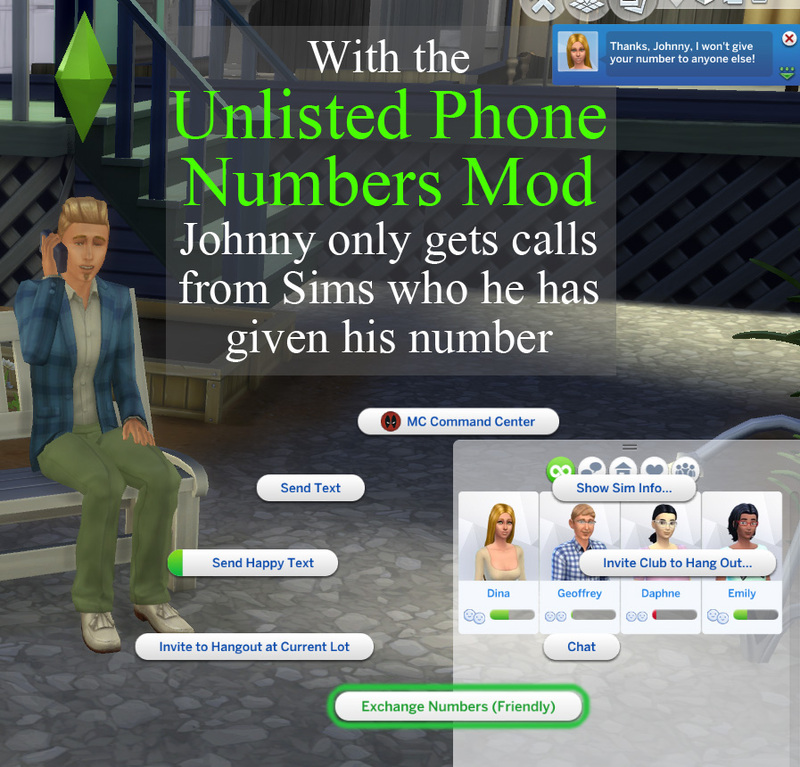 With this mod in place, Sims that you haven't exchanged numbers with will not call to bother you because they don't know your number. If you haven't exchanged numbers with any other Sims, then your played Sims will simply not receive ANY calls, ever (some restrictions apply, see (*) below for details). 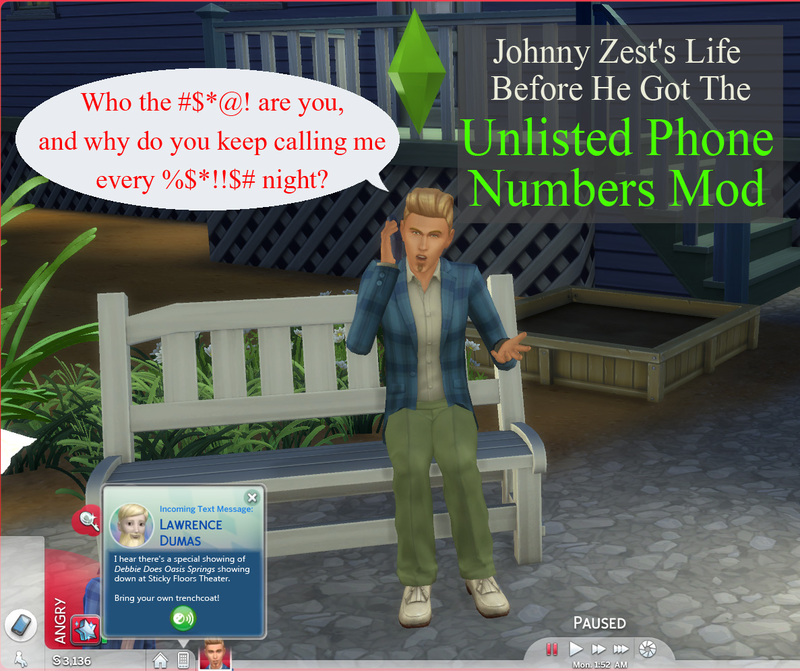 To exchange numbers with another Sim, you can either target them on the relationship panel and your Sim will give them a quick phone call to let them know the number, or you can meet them in person and use the Exchange Numbers (Friendly) option in the Friendly actions pie menu. This will set a new relationship bit between the two Sims indicating they know each others phone number and that will be added to any "Sim Filters" used to determine who might call your Sims during the day to congratulate you on becoming friends with your toddler because she's a really cool Sim, or any of the myriad other reasons they will choose to call. 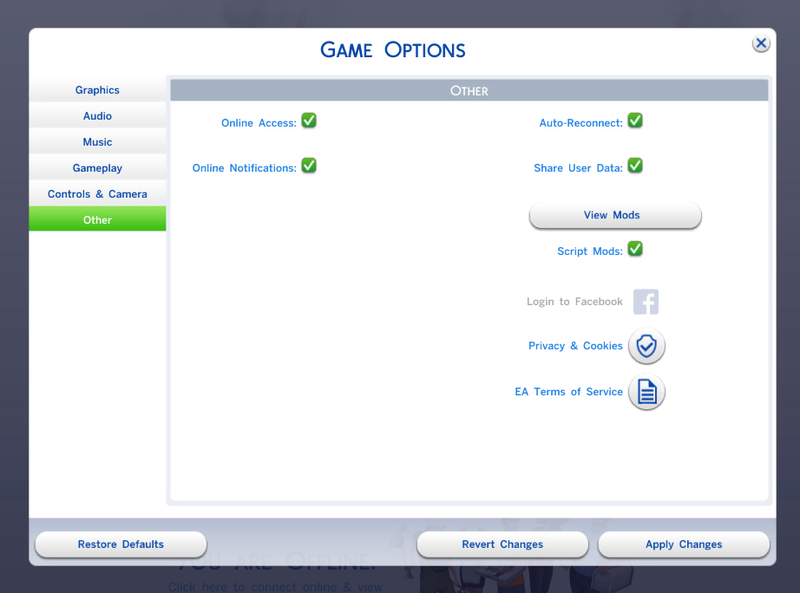 You can also revoke the exchanged numbers on the relationship panel if you want a Sim to no longer call you. (*) Some of the "drama nodes" are intentionally not filtered by this mod, for instance the Vampire Introduction calls. The scheduling of calls occurs at 3am every Sim day, so even if you exchange or revoke a number the currently scheduled calls will occur at their previously determined time. Performing the romantic Exchange Numbers (if you have Get Together) will also set the friendly Exchanged Numbers relationship. When using the relationship panel to exchange numbers, Sims that have a dislike relationship will reject the exchange. 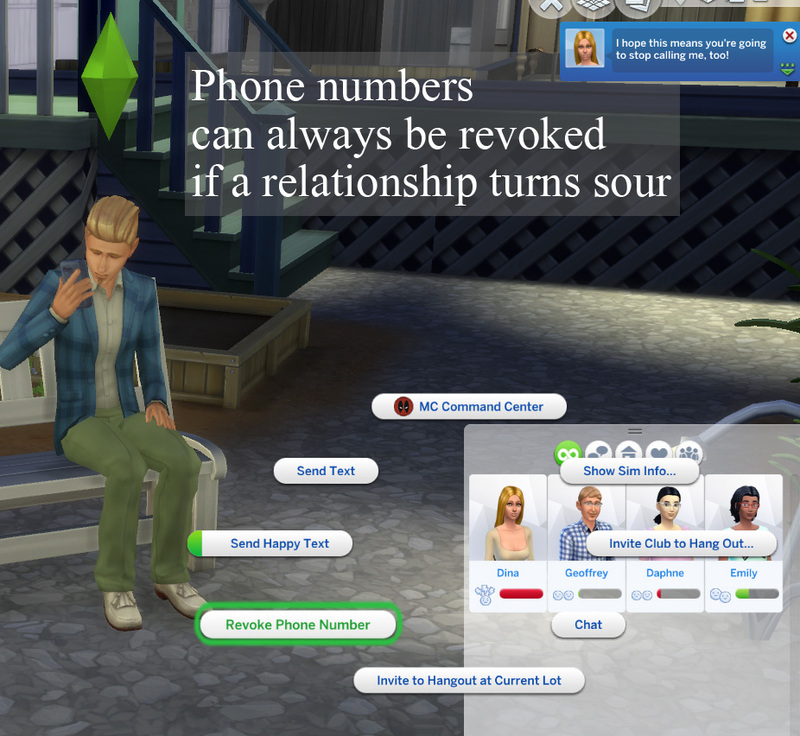 When using the relationship panel to revoke numbers, friendly Sims will not take offense at the action. If you hover over a Sim in the relationship panel to view your relationship with the other Sim you can see an "Exchanged Numbers" indication if they have done so. Mods that can clear relationships should work properly in clearing the new relationship bit if properly coded to look at all the bits. MCCC's "Forget Active Sim" action for instance will clear the Exchanged Numbers if used. The game's relationship culling should also clear it away if a relationship expires. This will not prevent a Sim's employer from calling if your Sim is late to work. HR has got your number. To install, unzip the two files contained in the download file into your game's mod folder. It can be placed in a sub-folder if desired. It uses a script, so the mod cannot be installed more than one sub-folder deep. This mod was written and tested on Windows for The Sims 4 version 1.51.75 (April 16, 2019). It should be compatible with any stuff or game packs and other mods. This mod overrides one game XML resource, S4_0904DF10_00000009_000000000001F064 (romantic-ExchangedNumbers) and will conflict with any other mods that modify this relationship bit (a very unlikely situation). This mod modifies the drama node scheduling scripts in the game to insert a new "sim filter term" prior to running the original drama node scheduler, and then removing that filter term after it is completed (in case that sim filter is used elsewhere for another purpose). This modification of the drama node scheduler should not conflict with any other known mods.